The Serpent Cave - Cueva de la Serpiente falls within the Archaic Great Murals Rock Art tradition, found in the central sierras of the Baja California Peninsula: San Borja, San Juan, San Francisco and Guadalupe. The two deer-headed serpents of Cueva de la Serpiente on the Baja California peninsula are spectacular and practically unique. Today, the right-hand one is complete, with deer-like ears and antlers and a long banded body. The left-hand one has lasted less well and only the head is preserved; the rest of the serpent was painted on a section of rock that fell away. The mural is almost 8 metres wide, with more than 50 diminuitive human and animal figures. 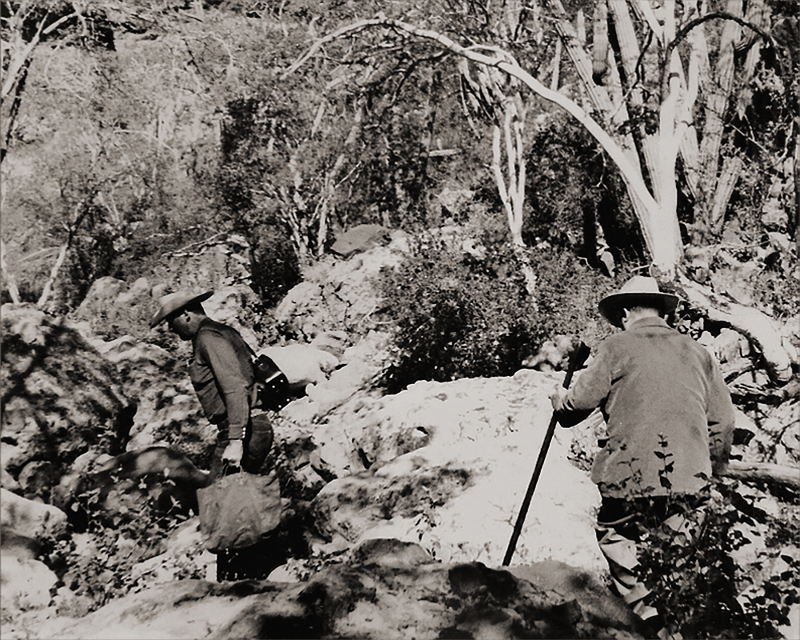 During his expeditions in the 1970's Harry W. Crosby was overwhelmed by the cave painting of Cueva de la Serpiente; an extraordinary composition that appeared to be painted by one artist. He claimed that no other site displayed such 'fanciful' creatures or such an interrelated theme. Despite the human and deer motifs resembling the other cave painting sites in Baja California, Cueva de la Serpiente was very individual phenomenon. 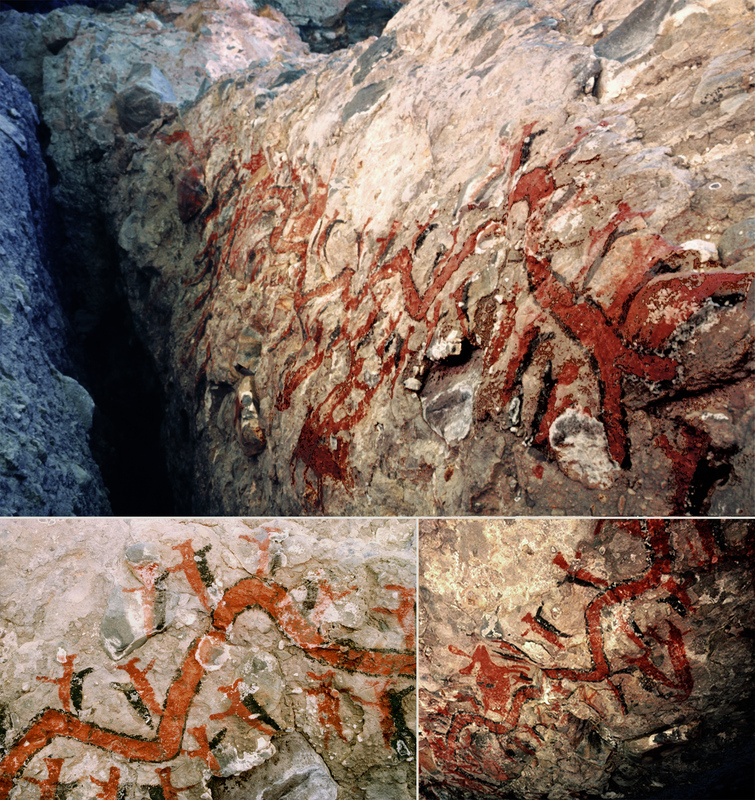 In a research paper 'Cueva de la Serpiente: Interpretive Analysis of an Archaic Great Mural Rock Art Panel' by Roberto Martínez, Larissa Mendoza and Ramón Viñas (2012) the authors explain that snakes are very uncommon in the Great Mural imagery, which makes the case of the two a horned snakes with fish-like tails that preside the panel at Cueva de la Serpiente practically unique. They offer several interpretations of this Great Mural rock art panel, found in Arroyo del Parral within the San Francisco Sierra. The panel composition, thematic, colour pallet, and site orientation, as well as ethnographical analogy and the contextual examination, are all important indicators for such interpretations. 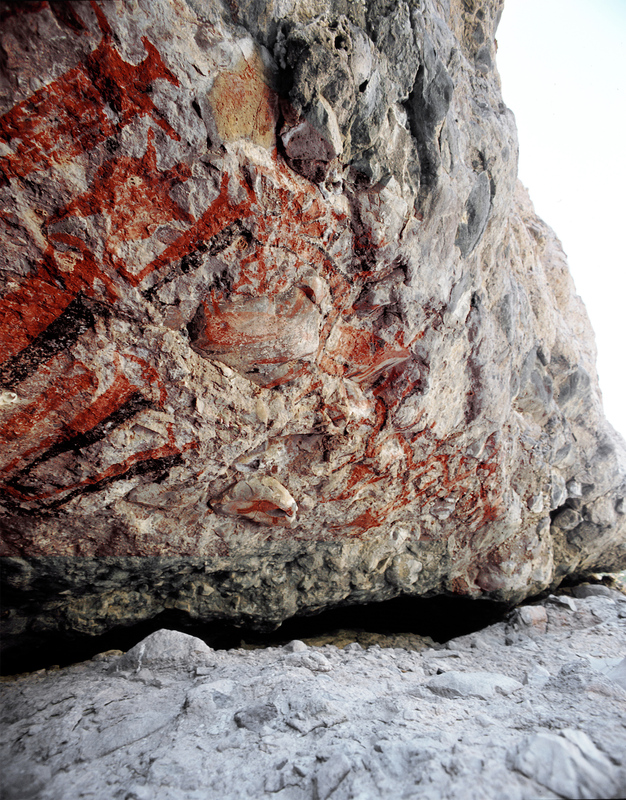 The motifs shown on the site's rock art are associated with concepts that refer to creation myths; death and the cyclical renewal of life and the seasons. The central figure of the horned serpent is present throughout the American continent and prevails in the worldview of several native cultures. They conclude that the horned serpent is associated to water, abundance and fecundity. The two facing snakes at Cueva de la Serpiente seem to symbolize the opposition of youth - the early rain season and its wealth of resources in life - and old age - dry and sterile. Many native American world views are based on duality and binary oppositions, which seem to constitute the panel's subject: the wet season generates life and, the dry season, death. Moreover, human and animal life is created, transformed and renewed. In this way, the equinox serpent of light and shadow might reflect the marking of a moment, when the dry season ends and new life begins. The horned serpents in the panel of Cueva de la Serpiente refer us to the seasonal transition from abundance to scarcity, as well as to the individual's personal transition through life, and the process of renewal and the creation of new life.